Aside from the exterior of the house and its curb appeal, what makes the house more inviting for guests is the interior. Of course, it is where you would entertain them and you always want your guests to feel comfortable while in your home. But it isn’t just the important parts of the house like the living room, dining room, or kitchen that needs to be beautified. Every corner of your home has to be well-designed. And to make good use of space, you can also make it functional. One area of the house that we need to take good care of is the entryway or the foyer. 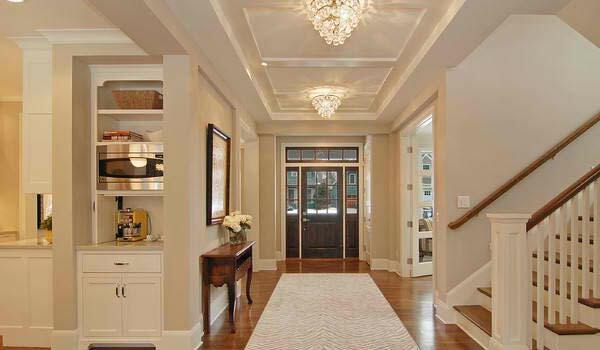 Before your guests could get into the living room and other parts of your home, they will get through the entryway. Make it as inviting as possible and see to it that you decorate it in a manner that you are able to set a good mood for the home. Create good first impressions by setting up your foyer in a way that it will give your guests the right message about what you want them to know about you and your family. Remember that everything in your house speaks of what kind of people lives in the house. Start a good impression from the entryway! Here is how. 1. Be creative with lighting. The best way to add glamour to the entryway is to install lighting. But this isn’t just the usual lights that we use. It has to be beautiful, attractive and could illuminate the entryway. You can use chandeliers or pendant lights. Others combine different designs of lights for a more interesting appeal. 2. Add a lovely seating. 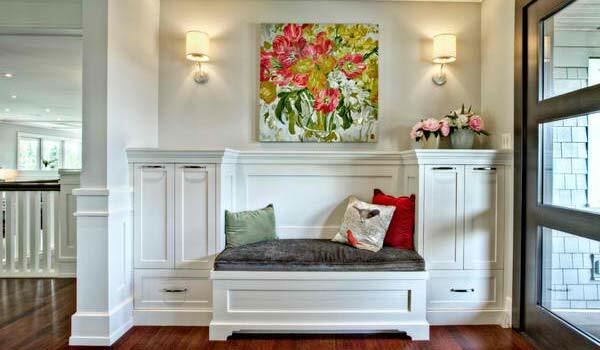 Make your guests feel more welcomed by adding a beautiful bench or whatever seating in the entryway. The design of the furniture should go with the style of the interior. This way, the guests will immediately get a clue of what the home’s look would be. It would be nice to add a bench so that those who come could relax in the entryway too. 3. Place a mirror on the wall. Mirrors can do wonders for the interior. 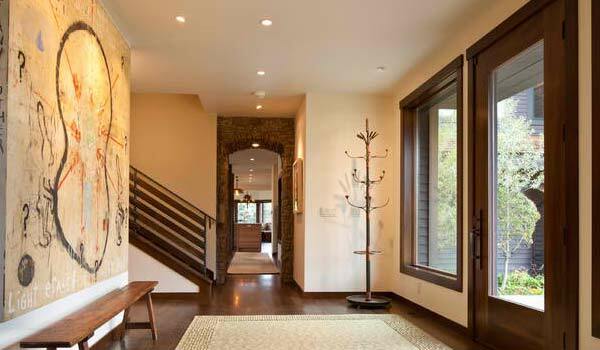 It attract natural light and open up even a dark entryway. Mirrors can also add additional space. But make sure that the mirror fits the hallway’s size. Choose a frame that fits your style or that extends the look of your interior. 4. Let the walls speak up with style. 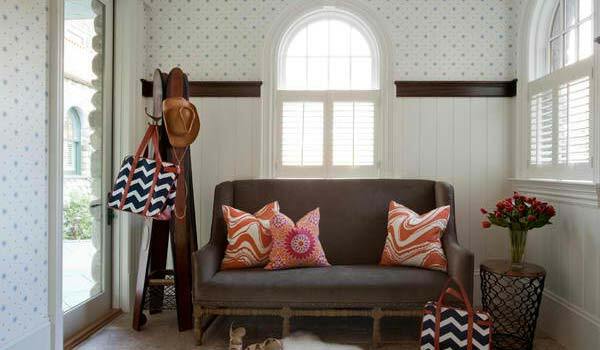 Say no to a boring wall for the entryway. There are many ways to add style to your walls. You can place wallpapers on it, decorate it, paint it with lovely colors or add some textures to it. You can also create an accent wall as well for more interesting aura. 5. Use area rugs for a warm welcome. Don’t belittle what an area rug can do. It doesn’t just add color and life to a space but it can also define the area. Adding an area rug on the floor brings in a soft feel and would make your guests feel even more welcome. Keep away furniture from the rug. Just give it a chance to shine! 6. Beautify the stairs near the entry. 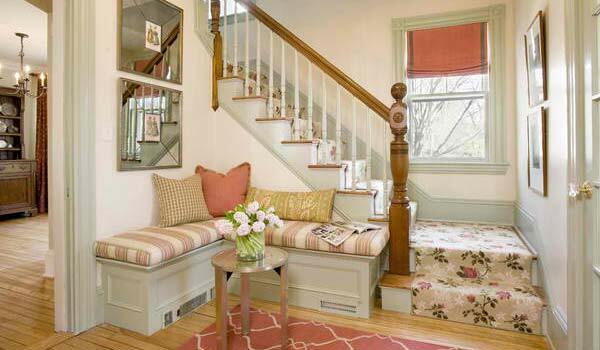 If your entryway is near the stairs, make sure that it will greet people who gets in your house with beauty. Don’t leave it plain. You can cover it with carpet or paint it with bold colors. This way, scuffmarks are hidden. 7. Create an accent wall. 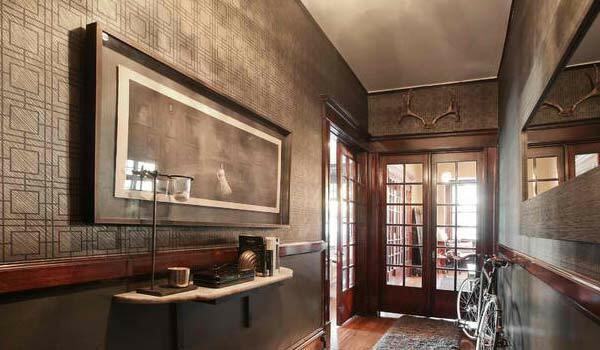 We have mentioned this already but creating an accent wall is really a huge step to make your entry look beautiful. Some add some unique murals to the wall while others play with wall textures ranging from stones to wood. A huge painting can also do the trick. This will be the highlight of your entryway. For sure, it will be a perfect background for a selfie! 8. Place furniture with multi-function. Expect that the foyer will be used every day. To make the most of the space, pick furniture that works with a dual purpose. It can be a bench with a storage area or other furniture with organizational solutions. This way, you can place some stuffs there that you need to bring with you every day and it will be easy to retrieve it. 9. Turn it into a mudroom. If necessary, you can turn your entry into a mudroom where you can place shoes, coats and others. This is recommended for homes that are located in areas with frequent rain and snow. This way, dirt will not be carried to other areas of the house. But make sure your mudroom looks presentable and clean too. 10. 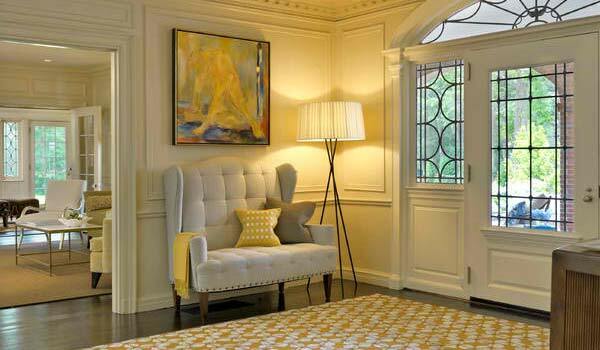 Use architectural features for added appeal. 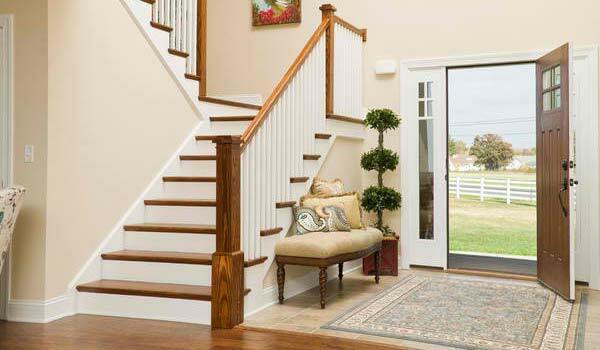 Some homeowners choose to leave their foyer that way. They can do this because the area is already well-designed. No need for decors or furniture since it is already a beauty when left without any accents. 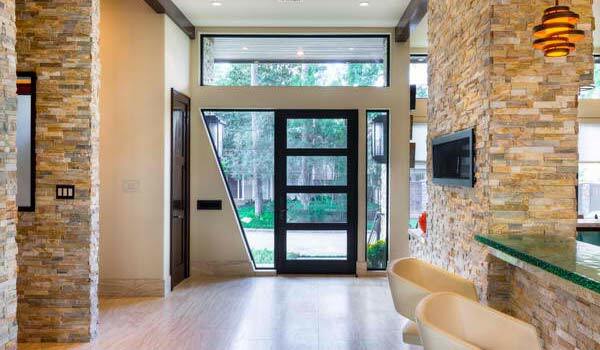 Just like the example above where you can see angled wall, beautiful modern door and stones on the wall. But don’t forget the lights of course. Not hard at all! So, if your current entryway is dull, boring and just nothing but plain, change the way your guests will look at you by updating the look of that space. They might even love being in your house if your entryway is that inviting. Well, you can do whatever you think is perfect for your home. You have different choices, anyway! Keep on decorating and updating your spaces with ideas, tips and inspirations from Home Design Lover!